Commercial & Residential Electrician in Davie, FL Our completely licensed and insured all-star electricians strive to ensure that you will only receive outstanding customer service and care. 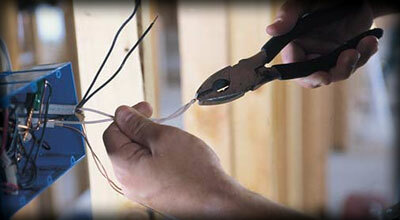 Our whole staff of electricians works to meet and exceed your expectations. If you want the best quality, you can count on Code One Electric. Please contact us at any time! We look forward to hearing from you. Give us a call at 888-320-2942, or email us and set up an appointment by going to the contact page. Some of of the residential electrician services we provide include wiring for hot tubs, pools and spas, wiring for home office equipment, ceiling fan installation, home remodeling, kitchen and bath remodeling, landscape lighting, custom residential recess lighting and controls, old and historic home rewiring and renovation. It is best if you bring in a qualified electrical technician for your electrical projects because not only is electricity harmful, but it will cause safety issues when and if the work is not done correctly. It’s always best if you hire a professional electrical technician to deal with any of your electrical installations. As a business owner, you're going to run up against commercial electrical problems that can only be solved by a commercial electrical contractor. Your job might be new lighting, wiring new equipment, or upgrading an older building. What ever your commercial electrical needs might be, Code One Electric can help. Electrical services in an industrial setting are always best left to the qualified electrical technician. Code One Electric is experienced with the installing different types of electrical components, installing complex wiring and re-routing electrical systems. Don't Stress, Call Code One Electric Today! © Copyright Code One Electric. All rights reserved. Unauthorized duplication is a violation of applicable laws.